With more than 35,000kms of magnificent coastline, Australia offers some amazing scuba diving, in the tropical waters of the world renowned Great Barrier Reef and northern Western Australia, as well as temperate diving in the southern states and Tasmania. Both tropical and temperate marine life are found in the Solitary Islands off northern New South Wales, popular Byron Bay near the Queensland border, and the fabulous Abrolhos Islands on the west coast off Geraldton. that you can browse and book online. Cairns is one of the best places in Australia to learn to dive, you can join Deep Sea Divers Den for the adventure of a lifetime learning to dive on the magnificent Great Barrier Reef. Deep Sea Divers Den's friendly, personalized service, combined with the warm tropical waters of the Great Barrier Reef, are the perfect combination for one of the very best PADI 5 Day Openwater courses available. No pre-dive experience is necessary, however being a comfortable swimmer will be a definite advantage. There are many different options on how to become a PADI certified diver. For your safety, a Diving Medical to Australian standard 4005.1 is a prerequisite to the PADI Openwater Certification course. It is a good idea to complete this medical prior to commencement of the course to avoid disappointment if a medical condition inhibits diving. Alternatively, a Dive medical can be arranged at the Deep Sea Divers Den Dive Centre on day one of the course. The first two days of the course are taken up by pool and theory training. After the pool and theory training, you spend three days at sea on OceanQuest, a liveaboard dive boat, to complete your four training dives. Finish off the course with four pleasure dives and a guided night dive. Cod hole - Two days/two nights. Day One - is making our way North along the Agincourt and Ribbon Reef systems. 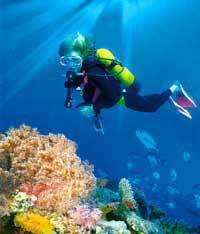 Enjoy 3 day dives and a night dive. The night dive you choose may be included as part of the optional advanced diving course. Yes, believe it or not, in Sydney at Manly Oceanworld you can scuba dive with sharks! They have two tours, one exclusively for certified divers and another introductory dive for those who have never dived before. What a blast for your first dive! Blue Wing - Boat diving is the only way to see the magnificent South Solitary Islands near Coffs Harbour. What a better way than with the longest running charter operator! 260-kilometre-long Ningaloo Reef offers world class diving through to family snorkeling in sheltered lagoons crammed with coral gardens. 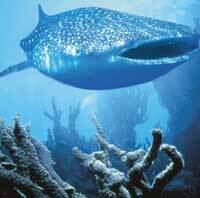 Ningaloo is the largest fringing coral reef in Australia. It is the only large reef in the world found so close to a continental land mass; about 100 metres offshore at its nearest point and less than seven kilometers at its furthest. The park covers more than 4000 square kilometers and was declared in 1987. Put your business on this page! Have you done ( or know of ) any amazing Australian scuba diving? Then contact us!